Check out this exciting video about the Crown Royal Presents the “Your Hero’s Name Here” 400 at the Brickyard. The past few years, Crown Royal has provided a once-in-a-lifetime experience to a deserving military member through its Crown Royal "Your Hero's Name Here" 400 program, which awards race naming rights to a fan. This annual program provides naming rights to the NASCAR Sprint Cup Series race on July 29, 2012 to a deserving hero – from servicemen and servicewomen to firefighters, police officers, first responders and local volunteers. The video showcases the previous winners’ amazing experiences that truly turned them into a celebrity for the day – something that can only be done at a NASCAR race. This year marks the first time the winner will have their name in lights at one of the most prestigious venues in sports, Indianapolis Motor Speedway. NASCAR Race Mom attended last year’s event: “Crown Royal Presents The Matthew and Daniel Hansen 400.” (related article here; here; and here ) I had a blast! To nominate a hero for naming rights to the race, you can submit a short entry via the “Crown Your Hero” tab on the Crown Royal Facebook Page. Nominations will be accepted through April 30, 2012 and the five finalists will be announced in May. Fans will then be provided the chance to cast a vote to determine which hero will get to see his or her name taking center stage at the Brickyard this summer. The winner will be revealed in a special ceremony leading up to the race. 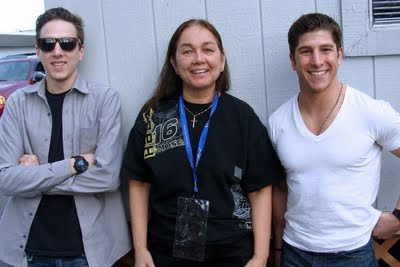 NASCAR Race Mom, and Mike Arone of The Rugged). We came in second in the Capture the Crown Scavenger Hunt.